The event editor window provides a great way to associate event names and actions to components. In previous versions of Fabric (<2.2.9) it was necessery to add an event listener into a component that you wished to send an event. Though this is still possible the new version of the event editor (>2.2.9) no longer requires the presence of an event listener making it much easier to perform a number of event actions on mutliple components at the same time. The event groups section display the various groups that can keep events names. By default if a Fabric Manager is present in th scene the "Global" event group will always be available, in this group you can place all the global event names. Any external group components (components outside the main Fabric hierarchy) will also be shown in the event group list. The Event Name section makes it possible to Add/Rename/Delete the selected event name but allso provide options to Load/Save as well as Import/Export the event list. For each event a number of event actions could be assigned each tergeting a specific Component. 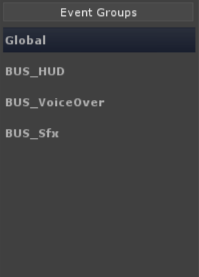 The Ignore property disables the editor event action and allows the action that is posted by the game to go through to the component. Ignore GameObject Ignores the game object posted by the game and uses the Fabric Manager instead. Each event action provides its own set of properties that can be set in here, for a full list of the event actions and their associated properties you can check the Event Trigger section of the manual.